Sany concrete truck mixer SY308C-8 with 8 cubic meter mixing capacity is equipped with ultra-high strength integrated auxiliary frame, ensuring its stability and high strength. 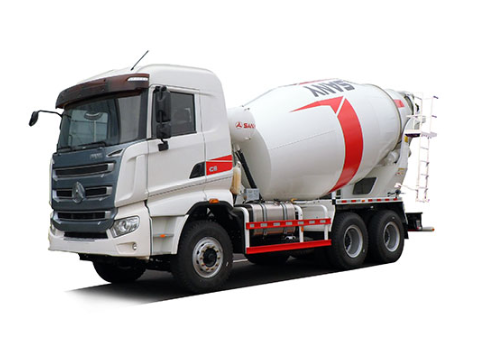 The 8 cubic meter concrete truck mixer can adapt to varied harsh conditions and improves its service life. The specially designed cab is made using the newest robotic welding techniques and complies with the strictest front collision and top pressure regulations. The instrument panel, mirror placement and overall design contribute to a field of view unparalleled in the industry. The four point shock absorbing mounting, double layer door sealing, and noise reduction technology built into the cab help reduce driver fatigue during those long days on the job. The interior trim of red and black exudes a sports car feeling to reduce visual monotony. Bluetooth technology with steering wheel controls allows hands free use of mobile devices (where permitted) to maintain contact with coworkers. The cab tilts forward to allow easy access to engine and transmission for maintenance. The front mounted air conditioning components allows for ease of maintenance and repair, saving time and money. The modern European/American styling of the cab accents gives a car like feel. The trim, instrument panel, and seats are of high quality materials. By making full use of engine braking, braking distance has been reduced by 15% and brake lining wear is decreased by 50%. SANY uses a high volume air compressor, high quality piping, and new sealing technology that shortens air build up time quickens brake response time. The engine dual power mode, coupled with the unique intelligent transmission’s power matching technology results in a 10% fuel savings. The large displacement power steering pump reduces operator effort by 40%. Optimizing chassis geometry and front axle steering angle reduces the turning circle by 15%. The three section blade provides an efficient discharge angle. The flushing device, an innovative front taper and ball-crown connecting structure are installed at the rear taper, in order to clear stagnant aggregate from the dead space, and to prevent aggregate from piling up at front and rear tapers. Due to this, the residual rate at the discharge port declines to 0.4%. Each truck is equipped with a GPS system, which boasts five functions including truck monitoring, record/playback, alarm reporting, truck management, statistics and analysis. With this information you can keep abreast of the mixer truck’s location, maintenance items, discharge, etc. Dashboard mounted monitor provides maintenance alarms for the truck’s key components such as engine, axle, and transmission in order to facilitate maintenance scheduling. How to maintain motor of concrete mixer?